Hernán Cortés often gets all the credit for the fall of the Aztec Empire. However, it’s important to remember those closest to Cortés as he gained his glory; He heavily relied on men to fight for him and Malintzin, a woman, to speak for him. In many of Cortés’s letters he calls Malintzin, “la Lengua,” or the tongue. Cortés’s nickname for Malintzin labels her role as his translator (Díaz del Castillo). Malintzin was a significant woman figure in Mesoamerica during the Spanish Conquest in 1519 and without her Cortés may not have succeeded in taking down the city of Cholula and the Tenochtitlan. Today there is a division in how México depicts Malintzin’s role in the Spanish Conquest in 1519. She was either the woman who betrayed her people or the fantastic lover of Cortés. Such myths stem from the fact that Malintzin holds an egregious reputation among modern México. The myths stem from misconceptions of Mesoamerican unity at the time of the Conquest and how much freewill Malintzin had while with Cortés. Malintzin was not bound to a nationality or large entity. 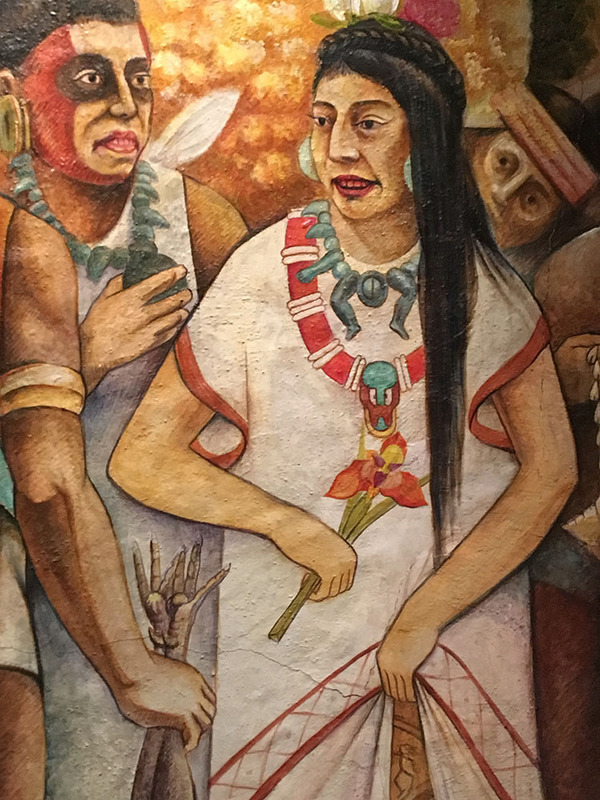 “At this time in Mesoamerica, the indigenous had no sense of themselves as “Indians” united in a common cause against Europeans” (Rethinking Malinche 312). So, when Malintzin “was given to Cortez [to be his slave], she had no one to turn to, nowhere to glee, [and] no one to betray. She was not Aztec, not Maya, or any other native,” (Rethinking Malinche 311). While she was among the Spanish, she remained as an outsider. Malintzin was not betraying her indigenous peoples, nor was fully accepted by the Spanish. Malintzin’s life was not a love story, nor was she a person blind with ambition (Rethinking Malinche 312). Rather, “it is the record of a gifted woman in impossible circumstances carving out survival one day at a time” (Rethinking Malinche 312). It is in the secondary accounts of Malintzin’s life that show how she was abused. According to Bernal Dias del Castillo, close companion to Cortés, Malintzin was from a noble family from Paynala, or Coatzacoalcos, México (Colliding worlds 55). Malintzin was educated, and her status did not protect her from being treated like an object or “disposable property” (Rethinking Malinche 298, 301). After the death of Malintzin’s father and her mother’s new betrothal, she was gifted to a man as a slave. In 1519, Malintzin was gifted to someone again—to Cortés. Some consider Malintzin to be this great lover of Cortés because she bore two him two children. However, it’s important to remember Malintzin had to distinguished herself from twenty other captives that were given to Cortés from Tabasco. Chontal Mayas (Rethinking Malinche 301). She had to distinguish herself in order to gain favor so could protect herself. Malintzin’s linguistic versatility helped her achieve protection. Malintzin had a gift for learning languages. Her native tongue was Nahuatl, but she learned Maya and Spanish. Like Cortés, she too entered cities she did not know and heard strange languages. When she did not speak the indigenous languages, she had enough local knowledge to ask for help. 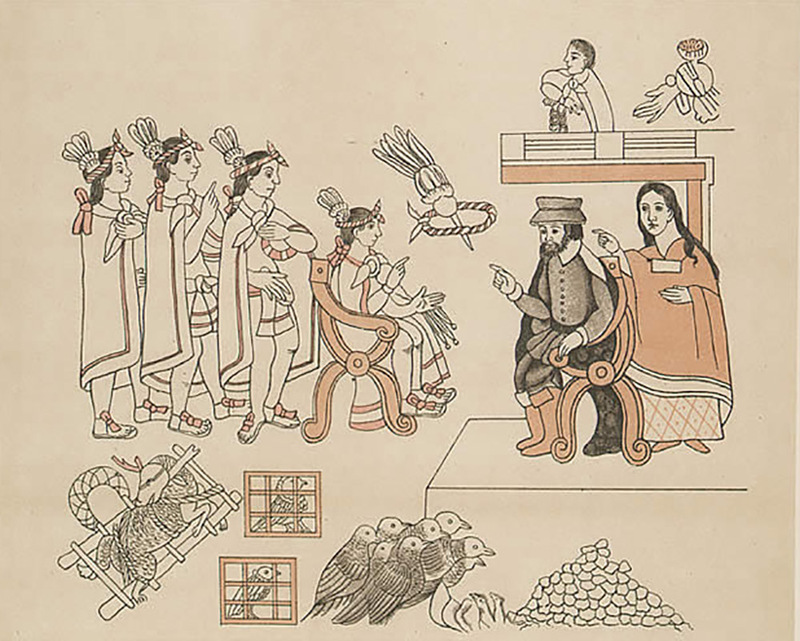 For instance, when Cortés was in the Totonac’s territory, she knew that the Totonacs paid tribute to Montezuma. The resourceful action she took was to ask for a Nahuatl interpreter. At times, “Cortés was forced to rely on a chain of translators, which included Malintzin” (Colliding worlds 56). Malintzin quickly became an asset to Cortés during the conquest. Her role as a translator allowed Cortés to obtain safe passage and allowed him to network. A part of Cortés’s success resulted from Malintzin’s skill in language. After all, Malintzin lead the expedition that conquered Tenochtitlan (Scully). Malintzin was able to maneuver in diverse societies. Along the way, she once again distinguished herself with how she was able to maintain respect to the royalty; her upbringing in a noble family taught her tecpillahtolli, a form of lordly speech. 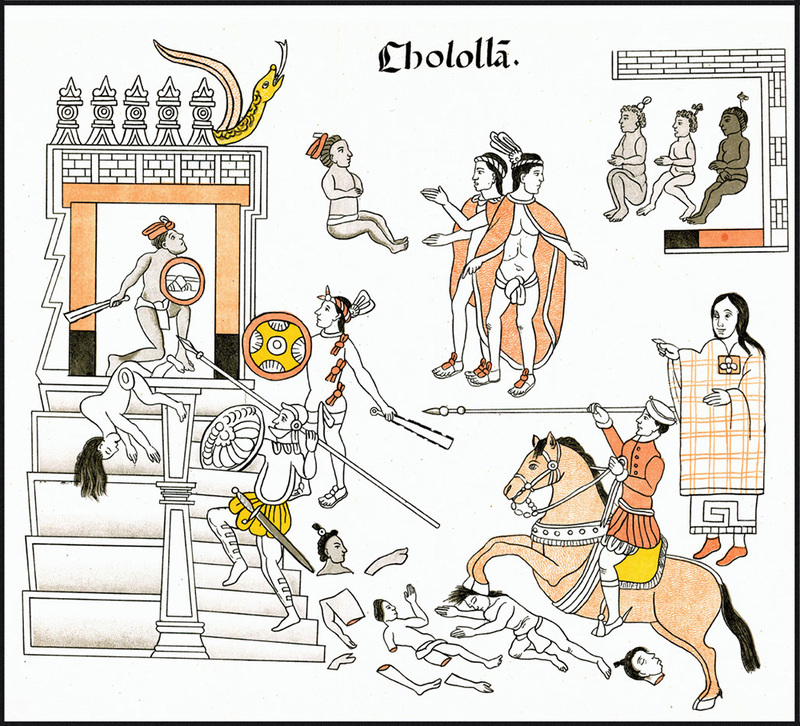 In tecpillahtolli, it is respectful for one’s body language to show the opposite of what one means (Rethinking Malinche 301). The grammar was extremely elaborate (Rethinking Malinche 301). This high language was used when Malintzin spoke on behalf of Cortés to the royal chiefs. She is the one who helped Cortés engaged with King Montezuma in Cholula. Cortés tried to manipulate natives, through tricks or sweet talking them. Likewise, the native tried to do the same. According to Bernal Dias, it was Malintzin that prevented Cortés from being schemed against (Rethinking Malinche). Bernal Dias reflective says, that “without the help of Doña Marina [also known as Malintzin] we could not have understood the language of New Spain and México.” Though Malintzin was in the shadow of Cortés, she was one of his greatest resources during the Spanish Conquest. Savanah Nicole Burns , “Hernán Cortés: His Translator Malintzin ,” HistoricalMX, accessed April 19, 2019, http://historicalmx.org/items/show/49. Townsend, Camilla. 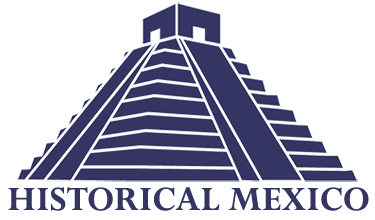 "Burying the White Gods: New Perspectives on the conquest of Mexico" In The American Historical Review. Vol. 108, No 3. 2003. Díaz del Castillo, Bernal. Chap. 22-23 in The Discovery and Conquest of Mexico, 1517-1521. 1585. Translated by A. P. Maudsley. New York: The Noonday Press, 1965.